Chef In Residency HAS MOVED to Chef In Medicine! Thanks to everyone who has been on the journey from A Chef In Med School (2009-2011) to Chef In Residency (2011-2016). I have been out of residency since 2014 and moving to a new (and permanent) website was long overdue! Thanks to the my husband and webmaster who has worked with me to create Chef In Medicine (www.ChefInMedicine.com)! 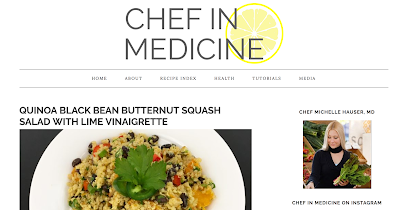 We plan to turn Chef In Medicine (CiM) into a much more expansive nutrition, cooking and health website. More video tutorials, cooking classes, e-cookbooks and health information are on the way. Head over to check out the new site and sign up for our email list to get updates on our progress! I realize that the sexiest thing to talk about around the holidays is not how to reduce salt intake. However, I can't count the number of people that I've seen admitted to the hospital around the holidays due to "dietary indiscretions," namely eating too much salt. Before you chock this up as the worst holiday blog post ever, please read on! 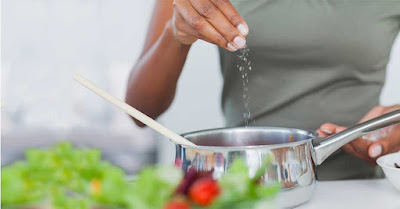 I have had several interview requests lately on how to limit salt in the diet without sacrificing flavor. The latest was with BottomLine Health (click the link to read the full article). People always seem surprised when I explain that if you limit ultra-processed foods in your diet and replace them with whole or minimally-processed foods, you can use herbs, acid, and a little salt to make dishes at least as flavorful--and often more flavorful--than the high sodium foods you may be used to. Most salt in the average American diet comes from processed and prepared foods--not the salt you add at the table. Therefore, if your diet is made up mainly of fresh, whole foods, you can add a little salt during cooking and still consume far less than if you ate processed or prepared foods! 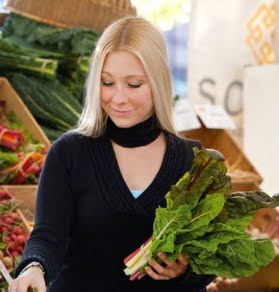 For maximum flavor, eat a varied diet rich in plant foods (like whole grains, vegetables, fruits, beans, nuts and seeds) in every color of the rainbow, and utilize flavor-boosting cooking techniques like roasting, searing, caramelizing, reducing, dehydrating, and grilling. Fill your spice cabinet with interesting seasonings from around the world. Experiment with them and find your "go to" flavor boosters to add to homemade dishes. If you don't want to drop a paycheck buying spices, choose a region of the world whose flavors appeal to you and get only those flavors to begin with. In our home, Latin flavors often win out, so we always have dried garlic, chilies, cumin, coriander, and smoky paprika. To add fresh flavors that pair with these, keep limes, cilantro, and scallions handy. Coming soon...the Worlds of Flavor Chart of spices and herbs from around the world. Stay tuned! I was recently asked, "how do you reconcile your training as a French chef with your plant-based diet?" I responded that the skills learned in French cooking school translate to most other cuisines--you just need to learn to work with a few new ingredients when you no longer have butter and cream at your disposal. 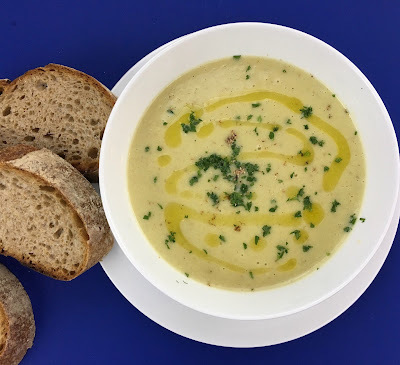 This is easy to say, but here is a delicious example of how to reimagine a classic, French potato leek soup, called vichyssoise, using only non-dairy ingredients. I have to say that I was shocked by how good this turned out and am kicking myself for waiting 15 years to try making this without dairy. This recipe has earned its place in my winter recipe rotation. The added bonus of making it dairy-free is that this version is also cholesterol-free. The inspiration for this came, as it often does, from my local farmer's market. I spotted some beautiful, baby leeks (for $1 per bunch) sitting next to an assortment of freshly dug potatoes. For leek novices, here is a picture of regular-sized leeks. You'll notice that unlike onions, the dark green leaves are flat, not hollow. Any type of leek works in this recipe. I used baby leeks, which look like scallions but with flat green leaves rather than hollow green leaves. 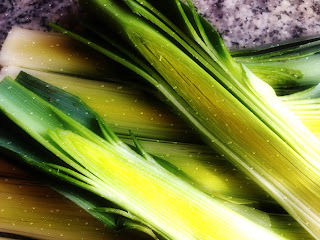 Leeks--make sure to use only the white and light green part for cooking. Save the dark green portion for stock. Before using leeks in a recipe, cut them lengthwise down the center and run water between the layers or swish them vigorously under water to remove the sand that hides between the layers. 1. In a measuring cup, combine cashews with boiling water, filling to 2/3 cup line. Let rest while preparing other ingredients. 2. Melt Earth Balance in a saucepan (at least 3-quart size) over medium-low heat. Add leeks, stir and cover with a lid. Cook for about 10 minutes, or until leeks are very soft, stirring occasionally. Take care not to brown the leeks as this will give soup a bitter taste. 3. Meanwhile combine lemon juice and soy milk and set aside. 4. Once leeks are soft, add stock, potatoes, bay leaf and a few twists of freshly ground black pepper to the pot and bring to boil over high heat. Once boiling, reduce to medium-low and cover with a lid; soup should be just simmering. Cook for 15 minutes or until potatoes give little to no resistance when pierced with a fork. 5. Meanwhile, dump cashew mixture into blender and blend until completely smooth; remove mixture from blender and set aside. 6. Once potatoes are done, scoop most of them out of the pot with a fork, placing them in a bowl off to the side. Remove bay leaf and then add leek and stock mixture to the blender. Blend until completely smooth. 7. Use a ricer or press potatoes through a strainer or chinois (fine mesh strainer) with the back of a spoon. Alternatively, you can blend the potatoes with the leek mixture, but the texture of the soup will be a bit “gluey” and not nearly as creamy. Another alternative is to use a potato masher and mash well, understanding that your soup will be a bit chunky if you do this. It will taste good regardless of which method you use. 8. Whisk cashew cream, soymilk mixture, and nutmeg into potatoes until smooth. Then, slowly whisk in the leek mixture. Season to taste with pepper and salt. 9. Serve right away to have slightly warm soup or chill and serve cold. Sprinkle with chives or parsley and drizzle with a bit of olive oil, if desired. Delicious served with crusty, artisan bread. Want pesto, but not all the oil? 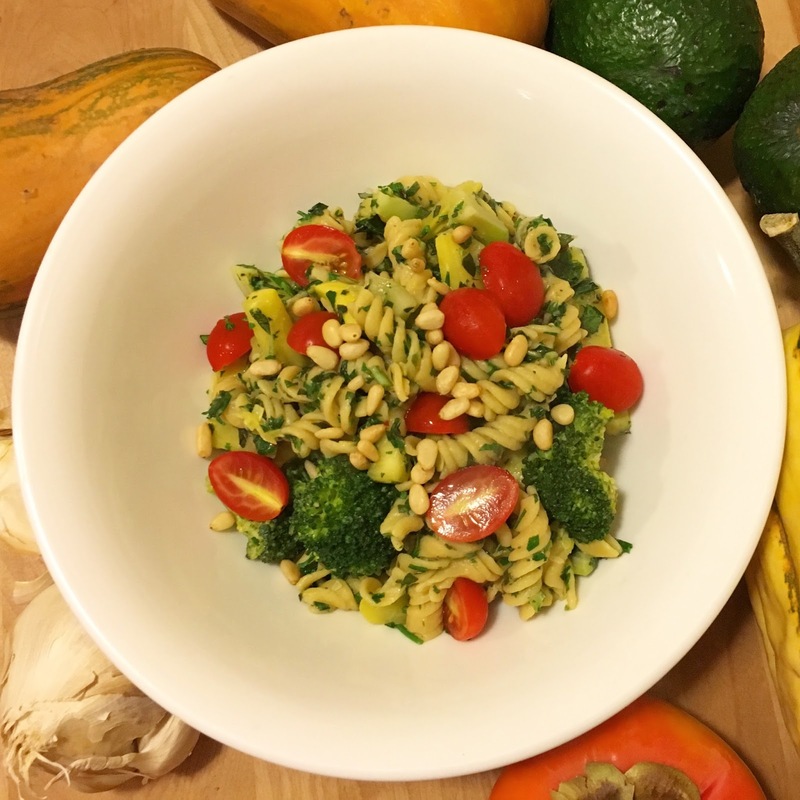 Chop and add all of the traditional pesto ingredients plus just enough oil to flavor. Pro tip: the addition of parsley helps to keep this “pesto” green. It’s not essential, but your pesto will turn brown shortly after preparing if you leave the parsley out. Boil pasta in salted water according to package instructions until al dente. 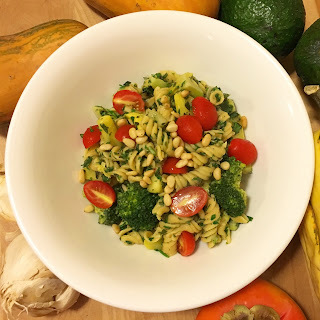 If using gluten-free or high protein pastas, rinse pasta at the end of cooking. Heat olive oil over medium heat in a large skillet. Add garlic and stir; add squash and broccoli before garlic browns and still well. Sprinkle with a couple pinches of salt and pepper. Cook about 5 minutes, stirring occasionally, until vegetables are cooked but broccoli is still slightly crisp. Add pasta and crushed red pepper flakes to the vegetables and reheat pasta. Add a few tablespoons of water to the pan if the pasta is sticking. Add basil, parsley and lemon juice. Season to taste with salt and pepper. Portion into bowls and top with tomatoes and pine nuts. If desired, drizzle with a bit more olive oil. Substitutions: You can substitute chopped walnuts for pine nuts. You can also substitute other vegetables—like colored bell peppers, carrots, asparagus, and cauliflower—for the vegetables used in this recipe.